Queen Elizabeth II led the Royal Maundy Service on Thursday in Northern Ireland. In keeping with the yearly tradition to mark Holy Thursday before Easter, The Queen handed out rare and specially minted coins along with regular circulation coins within small stringed red and white purses. 82 men and 82 women were selected from four main churches in Northern Ireland in recognition of their individual contributions and service. Each of the citizens received the purses and newly minted silver coins with a face value of 82 pence. 82 is the age of The Queen. Tradition dictates the monarch’s age is to be used in the each yearly service to determine how many individuals are selected and how many coins are handed out. The red purse contained a small amount of regular money to represent alms of food and clothing. The white purse contained rare 82 pence coins, which were specially minted sterling silver (92.5%). In addition to extremely rare, the Maundy coins are unique. The effigy of Queen Elizabeth II on coinage has seen four changes through The Queens’ reign. 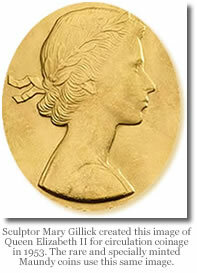 The Maundy coins bear Her Majesty’s portrait created by Sculptor Mary Gillick. This image was used on coins issued in the year of The Queen’s coronation in 1953, and early years. The word Maundy is derived from Christ’s commandment at the Last Supper to love one another, before he washed the feet of his disciples. The Royal Maundy service dates back to at least the 12th century. Only two services have ever been recorded to occur outside of England. This year marks the first one in Ireland. The service was attended by not only Catholics, but representatives of the Protestant, Muslim, Hindu and Jewish faiths. Pictures of yesterday’s service may be seen on the BBC News page, In pictures: Queen attends Maundy service. A video of the 2006 Maundy Service is also available, which offers background commentary with additional history of the service and tradition.